Longview Economics provides technical, fundamental and military reasons to be bullish uranium. 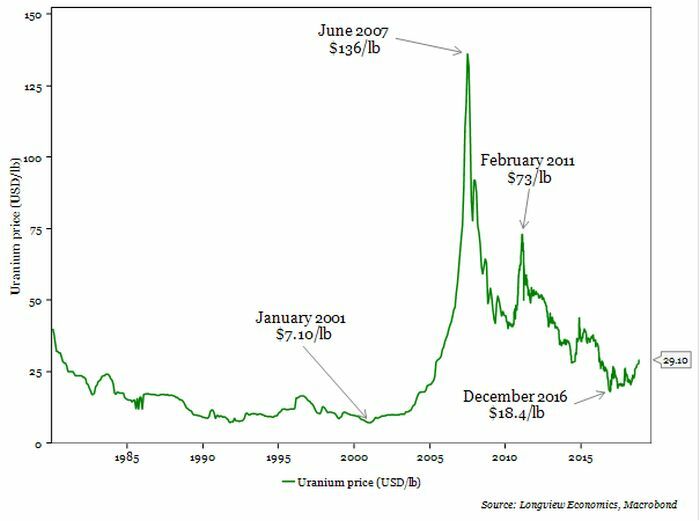 From 2001 to 2007 the spot uranium price rallied 175% from US$7/lb to US$136-138/lb to mark one of the biggest asset price bubbles in recent history, Longview Economics notes. From that level to the 2016 trough it fell -89%. In that time, the number of uranium mining companies has fallen from over 500 to just 20 currently. Rather than investing in future capacity, miners are shutting down capacity given the average cost of production is above the current spot price. A deteriorating supply outlook from other miners leads Longview to suggest a total loss of -17% of supply by 2020. The past five decades have seen five major asset price bubbles and subsequent crashes – gold, silver, iron ore, the Japanese stock index and the Nasdaq. Three of those asset prices recovered 20% of the losses in six years and two recovered 50%. Thus from a purely price perspective, suggests Longview, a significant recovery in the uranium price would not be unprecedented. If we take the 2007 price of US$136/lb as the high and the December 2016 price of US$18/lb as the low, a 20% retracement would suggest a price of US$41.60/lb and 50% gives us US$77.00/lb. However, as the graph below shows, the uranium price already had one go at retracement the actual bubble-burst crash, back in 2011, reaching US$73/lb from the 2010 low of US$40/lb. That’s 34%. Then came Fukushima. If we take US$73/lb as the high and US$17/lb as the low, a 20% retracement would give you US$29/lb and 50% gives you US$45.50/lb. Today’s spot price? US$29.00/lb, on industry consultant TradeTech’s weekly indicator. In the past twenty years, global nuclear power generation has grown by 0.5% per annum. In the next twenty years it should grow by 2%, Longview suggests. The driving force will be an increase in Chinese nuclear power capacity of 35% over the next two years. Between 2020 and 2025, another 91% of growth is expected. If new projects currently awaiting approval are added, China will account for 73% of global nuclear power growth by 2040, Longview calculates. But it’s not just about power generation. The US navy aims to build three nuclear-powered submarines every year beyond 2021 (up from two currently – and building on their current fleet of 50 nuclear-powered subs), Longview notes. Similarly, in the last fifteen years, China has built 14 nuclear-powered submarines with 19 currently under construction (the number of nuclear subs is likely to grow further as China’s influence becomes more global). India has recently commissioned its first nuclear submarine (the first country to construct a nuclear-powered sub that is not one of the five members of the UN’s Security Council). Global naval uranium demand currently accounts for 5% of total demand (down from 30% during the Cold War as Russia has since decommissioned most of its nuclear-powered naval fleet – a process which ended in 2012). Longview forecasts that share to increase to 11% by 2040. Last month President Trump announced the US would pull out of the Intermediate Range Nuclear Forces (INF) Treaty which limited the placement of missiles in Europe, which led the director of the Royal United Services Institute (RUSI) for Defence & Security to declare, “This is the most severe crisis in nuclear arms control since the 1980s”. If the INF treaty collapses, said Malcolm Chalmers, and with the New Start treaty on strategic arms due to expire in 2021, “the world could be left without any limits on the nuclear arsenals of nuclear states for the first time since 1972”. Global geopolitical tensions are growing. On that basis, nuclear capacity demand will also grow. Uranium is increasingly likely to serve as a key hedge against rising tensions, Longview believes. Last week saw TradeTech’s weekly uranium spot price indicator fall -US10c to US$29.00/lb. Due to the Thanksgiving holiday the consultant did not publish a weekly report. TradeTech’s term price indicators remain at US$30.00/lb (mid) and US$31.00/lb (long).